Australian Red Cross has donated its NSW archive to the Library, spanning over 100 years of humanitarian aid. Growing up in Bingara, about 600 km north-west of Sydney, my maternal grandmother, Nancy Nivison, developed a passion for nursing. But the strong disapproval of her parents meant this dutiful daughter could not pursue that career. In the 1920s young ladies like Nancy were destined to become wives and mothers. The Second World War and Australian Red Cross would change all that. Nancy married a First World War veteran and grazier and moved to Walcha to raise a family. In her late-30s, after the outbreak of war, she joined the local branch of the Red Cross. Having completed her training, she formed the Walcha Voluntary Aid Detachment. Since 1914 VADs, or Voluntary Aids, had been the public face of the Red Cross. Mainly women, they wore white dresses with a distinctive red cross on the bosom. Trained in first aid and home nursing, they worked as quasi-nurses and performed a range of domestic duties in Red Cross convalescent homes — scrubbing floors, sweeping and dusting wards, sorting linen and emptying bedpans. During the Second World War, these ‘maids of all work’ served in the Middle East and formed the basis for the Australian Army Medical Women’s Service, which was created in 1943. Back in Australia, VADs continued their volunteer work, with some helping war brides and their babies prepare for long voyages to meet their husbands in America. The highlight of Nancy’s war came when she was selected by Australian Red Cross to join a medical relief unit on board HMS Glory, a British aircraft carrier, from September to December 1945. Its mission was to pick up British and Canadian ex-POWs in Manila and transport them to Vancouver. A temporary hospital was set up in the vast aircraft hangar, with patients treated for malnutrition and a range of tropical illnesses. The ship also transported members of Australia’s 9th Division back from what is now Indonesia. On her return home, the VAD was disbanded and Nancy turned her new found leadership skills to other community needs, continuing to volunteer for the Red Cross and other causes until her death in 1972. For me, the donation of Australian Red Cross’ NSW archive to the Library brings to a close a personal journey that spans almost 30 years. Not only has Red Cross history dominated my academic life, but it also connects me with my grandmother. 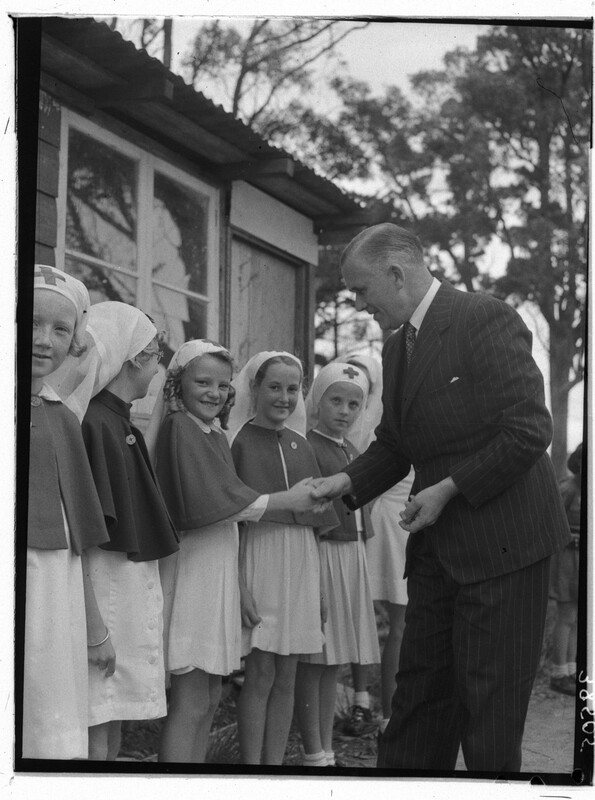 In 2014, when Australian Red Cross marked its centenary, the organisation decided to make its archival records and memorabilia publicly accessible. The national and Victorian records were recently given to the University of Melbourne’s Baillieu Library, and the NSW collection will be transferred to the State Library over the next two years. It contains over 500 boxes of archival material, thousands of photographs, posters, memorabilia and other assorted items from over 100 years of Red Cross history. Australian Red Cross forms part of a global movement. The International Committee of the Red Cross was formed in Switzerland in 1863, a year before the Geneva Convention established the rules of war. The International Federation of Red Cross and Red Crescent Societies, also based in Geneva, was created in 1919 in the aftermath of the First World War. The third part of the movement consists of 190 national societies such as Australia’s. 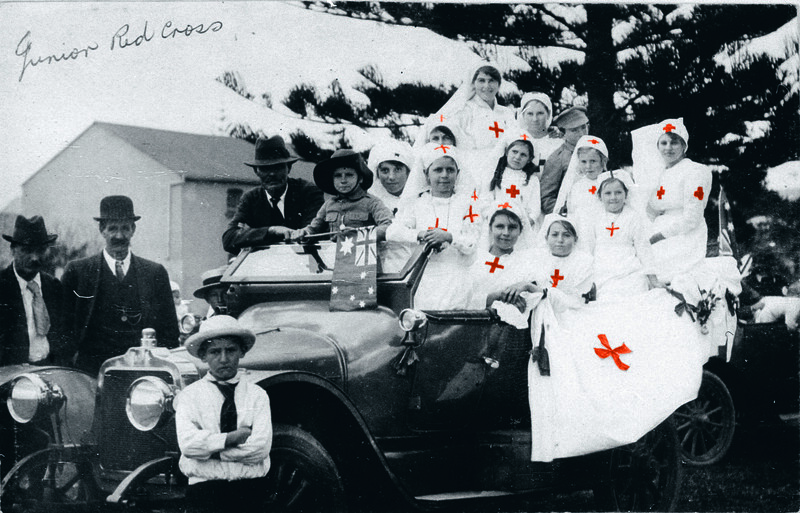 Australian Red Cross was originally formed as a branch of the British Red Cross Society. Its foundational President, the dynamic Lady Helen Munro Ferguson, was the wife of the Governor-General. Her detailed knowledge of the Red Cross came from her involvement in forming the Scottish branch five years earlier. The national headquarters was in Melbourne — the location of the federal government in 1914 — with each state establishing its own largely autonomous division. As I have done, many people will now be able to use the records to trace stories of their family members or uncover new information about their local community, stories that for too long have been hidden from our history. They will be able to make personal connections with major events that have had an impact on NSW. The Red Cross had an extensive network of branches across the state, and minute books of these branches (many now closed) form an integral part of the collection. Through its 100 years, Australian Red Cross has attracted a diversity of people to volunteer for its cause in a variety of ways. The VADs continued their work in peacetime, providing a volunteer army to respond to a range of natural disasters, from the 1950s floods in the Hunter Valley to Cyclone Tracy in 1974. VADs and other Red Cross branch members were on hand to assist the Red Cross Blood Bank through the NSW Red Cross Transfusion Service across NSW. The VADs were closed down in December 2009 after 95 years of service. From the earliest days of the organisation, the Junior Red Cross was another important program. NSW and Canada Red Cross share the accolades for founding this global organisation of children, which by 1935 boasted over 15 million members in 51 countries. The Junior Red Cross taught young Australians about active citizenship, fundraising and engaging with children from other countries and cultures. It also focused on health and first aid. One of the highlights of the collection is the light it shines on many less well-known individuals from NSW who have made a huge contribution to the state. Eleanor MacKinnon is one such individual. The Junior Red Cross was her idea and she provided energetic leadership until her untimely death in 1936. A wonderful wordsmith, MacKinnon founded and edited for many years the Red Cross Record and Junior Red Cross Record. Her small collection of papers held by the Library complements the newly acquired collection. It includes her correspondence with friends such as Billy Hughes, in whose electorate she lived, and whose politics she shared. The range of Red Cross work during the twentieth century was unparalleled, and its peacetime responsibilities became increasingly important. It played a role in the development of social work, and its Blood Transfusion Service, developed in the years after the Second World War, continues to this day. Its highly regarded Tracing Bureau, started over 100 years ago, continues to assist in disasters and national emergencies as well as linking refugees with family members. And the highly respected Australian delegates to the International Committee of the Red Cross contribute to humanitarian assistance programs across the world. These stories and more lie waiting to be discovered in the Red Cross collection. Professor Melanie Oppenheimer holds the Chair of History and is the Dean of the School of History & International Relations, Flinders University, South Australia. She is Australian Red Cross Historian and Australian Red Cross Ambassador. She introduced the Red Cross collection to the Library. This article first appeared in SL magazine Summer 2016–17.